Beijing's Central Business District, known for its designer shopping malls, high-end offices, multinational banks and iconic skyscrapers, is changing its image to meet the diverse demands of a wider customer base. China World Mall, built in 1990, is a flagship shopping space in the CBD that is home to boutique stores including Louis Vuitton, Fendi, Cartier and Mulberry. On the online forum Dianping, the most frequently mentioned descriptions of the mall include "most expensive", "landmark", "superb" and "high-end". "It's a taste of urban life that's different from the city's software industrial parks," said one online user with the name Daweisang. "Sitting at a rooftop bar, facing landmark architecture, you can feel the prosperity in the air." Located off the East Third Ring Road, the CBD comprises numerous office buildings and a cluster of luxury hotels. The atmosphere exudes class－even the tuk-tuk drivers charge double the going rate anywhere else in Beijing. But the district is gradually diversifying. This trend is best reflected in the New China World Mall, the third phase of construction of the China World Trade Center－the latest addition to the ranks of CBD skyscrapers. More restaurants charging between 30 and 500 yuan ($4 to $72) per meal, gyms and even a karaoke bar have moved in to meet the daily needs of the growing community of office workers. "By providing a greater range of offerings at various prices, landlords in the CBD are cleverly diversifying to target the broader CBD community," said Yang Jingjing, director of the retail leasing department at Jones Lang LaSalle, an international real estate service and investment management company. "Before, when we ate out, we were more likely to explore hutong (narrow traditional alleyways) for those small hole-in-the-wall places, or Sanlitun and the surrounding areas," Yang said. "In the past, white-collar workers would not typically choose to visit the CBD after work or on weekends due to the lack of options in the area. They would go elsewhere, where there was more variety. "As consumers increasingly seek new and exciting entertainment and lifestyle offerings, the CBD is changing to meet that demand," Yang said. "For example, we are seeing more cinemas open, which are of much better quality and even host high-profile movie premieres. "The number of cinema screens in the CBD area used to be very limited. The cinemas were also pretty small, so they could not host any premieres." Services in the CBD are steadily diversifying. For example, the food and beverage sector accounts for 21 percent of business at the New China World Mall. "As a retail destination, the CBD is more exciting today than ever," Yang said. "There are plenty of options here from yoga to karaoke. Along with abundant luxury brands, shoppers can also find indie designer brands. As landlords and retailers in the CBD continue to work together, the environment will become more vibrant." According to research by Jones Lang LaSalle, by the end of 2016 about 400,000 people were working in the district. When the new phase of the China World Trade Center started its trial run in the first quarter of last year, James Hawkey, JLL's head of retail for China, said: "The CBD lacked entertainment services such as karaoke or bars. The third phase of the China World Trade Center will fill that gap and stand out among other malls." "The area will add more options for nightlife and entertainment, and will be able to fulfill the consumption needs of the large number of CBD office employees. Such a change will make the area more competitive." According to research by retail information outlet Linkshop, major CBD retail properties－including the three phases of the China World Trade Center and the Beijing Yintai Center－reported total revenue of 9 billion yuan last year, with the former contributing 7.9 billion yuan. After the fourth phase of the China World Trade Center is completed, annual revenue is forecast to top 10 billion yuan. The fourth phase involves turning the former landmark Hotel Jen Beijing into a retail property. Zhong Rongming, general manager of China World Trade Center, said the company needs to maintain its vigor and vitality by following the latest trends, while choosing a suitable path for its "unique identity". 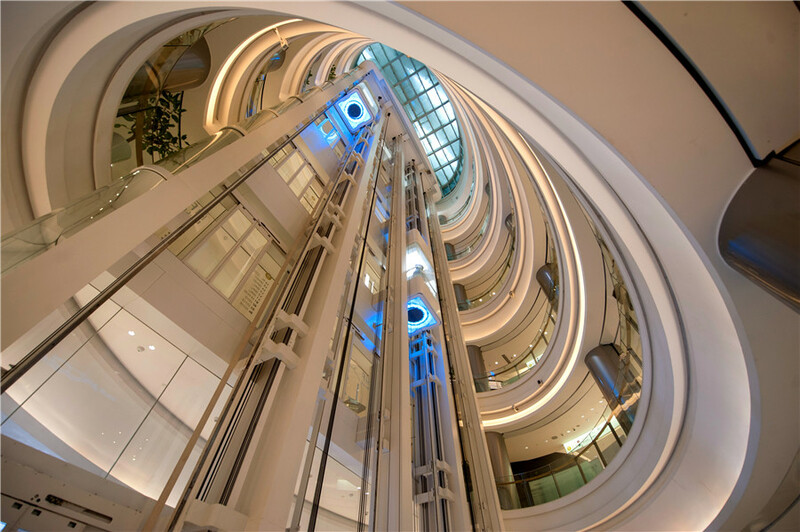 The new Hotel Jen Beijing features fusion restaurants, pubs and a top-level gym to meet demand from office workers and young travelers, Zhong said. Some shop owners feel that as the area's target customer base has shifted toward younger, middle-income consumers who want diversified experiences, it has become an ideal location for business. Lifestyle-focused SpaceCycle is the first fitness facility to move into the China World Trade Center. "Different from the China World Trade Center of one or two decades ago, we've observed that the business models and the community here are becoming younger and more fashionable," the company said. "They are dynamic, well-educated, excellent in their professions, and crave a quality life. Since the area is already equipped with premium infrastructure, including restaurants, shops, hotels and entertainment facilities, as well as consumers that meet our demographics, this area is a perfect location for our business." Among the buildings in the CBD, Beijing Parkview Green Fangcaodi stands out. It is hard not to pause and gaze at this giant, modern, angular structure. Built in 1992, Parkview Green houses high-end offices, boutique hotels and a shopping mall with carefully selected businesses that include Van Cleef & Arpels, Tesla and International Watch Co. However, focusing on luxury lifestyle brands is not what makes Parkview Green unique. It now features futuristic sculptures, paintings and installation artworks, which can be seen on entering the building. More than 1,000 pieces are on show, including 30 works from master surrealistic artist Salvador Dali. Oliver Lai, general manager of Beijing Parkview Green Fangcaodi, said the property is one of a kind and refuses to replicate anything else, or to be replicated. "Beijing is a city of fast changes, like nothing I have experienced elsewhere," Lai said. "As a business, we need to change as the world changes. We have observed the development of the Chinese economy in recent years, and people's demands are changing as the economy grows. "Rather than saying Parkview Green Fangcaodi has brought a brand-new shopping experience to Beijing, I'd say the fast development of the city has provided the possibility to combine life with art." Lai also said the company has a collection of masterpieces and provides visitors with space in which they can immerse themselves in art, allowing it to become part of their lives. Parkview Green has added a new trophy to the mall's awards cabinet, recently winning the Beijing Top 10 foodie destinations award from global city guide Time Out and Winshang, a Chinese commercial property information outlet. Guo Zengli, president of Mall China Information Center, a shopping mall information and research organization, said, "The success of Chinese shopping malls used to lie in precise marketing, but nowadays malls with a vision have entered consumers' inner world. "Parkview Green Fangcaodi does not have a very ideal location, not being close to a subway line, but this hasn't stopped the mall from becoming an industry symbol and a city landmark, because it is very hard to imitate or duplicate Parkview Green." Guo added that Parkview Green Fangcaodi carefully selects brands, works alongside them and always seeks to improve, meaning the shops suit the shopping mall and become part of its culture. "If a shopping mall or a brand wants to shock the market, it needs to build its own intellectual property, and make adjustments according to the changing market demand with its soft power and service," Guo said. As modern technology reshapes how people work, office space is changing, too. Such changes are making the CBD more attractive for Beijing's startups and small businesses. Cheng Ziheng, senior director of co-working brand KrSpace, which has two properties in the CBD and many others in cities nationwide, said, "I grew up in Beijing and used to commute through the CBD to school every day. "Back then, the first phase of the China World Trade Center was the only large building in the area. The offices mainly housed foreign companies, because no one else could afford such high rents. "Years ago, you would never have thought that Wi-Fi would work faster than a cable connection. Large rooms were needed to store paper files, and people had to fax, copy and print the files constantly, so a company needed more space." But the way people work has changed. More and more offices are adopting a paperless environment. Files are written, sent and stored online. With just a laptop, a desk and a chair, the modern office employee can work anywhere. Such a change means less space is required. More businesses, especially small ones, are able to rent an office in the CBD, which can bring great opportunities for companies such as Cheng's. At KrSpace, a four-person office space costs about 14,000 yuan a month, about the same for other office buildings in the area. "But it will help you save a lot of money, because you don't have to start from nothing, as in a traditional office space," Cheng said. "In a shared office, you don't need to worry about the facilities, as we offer everything, including the reception area, break rooms, office equipment and lounges. "You can rent conference rooms by the hour, unlike in a traditional office, where companies have to rent the space continually even if they don't use it very often." He said such a model has made offices in the CBD accessible to more businesses. "Foreign companies' local offices may only have three to four staff, but they need a central location. So they can rent here," he said. "Temporary teams in town for short-term projects, such as accounting teams, startups and companies in transition periods, can all benefit from an ideal location in the CBD without worrying too much about costs." According to research by online commercial property rental platform Haozu, the shared office market in China is expanding by more than 50 percent annually. By 2030, at least 30 percent of offices will become sharing spaces, it forecast. The report said the market size was about 9 billion yuan last year and is expected to top 100 billion yuan by 2030.